Save production costs by using the Lassco Wizer MS-1 Precision manual drill sharpener to resharpen all of your style A and L drill bits instead of buying new ones. This heavy duty drill sharpener makes it easy, fast, and reliable to resharpen your dull paper drill bits with a solid carbide cutting head. Equipped with suction feet for easy use, or you can remove them to mount the drill sharpener, the lathe style constructed MS-1 manual drill sharpener will make your production life easier and save you money. Check out the Lassco Wizer MS-1 today. Product number MS-1. Accepts style A, and L drill bits. Hello and welcome to MyBinding video. Lots of paper drilling makes for a very dull blade. Well, meet your new friend, the Lassco Wizer MS-1 manual drill sharpener. Paper drill bits are actually hollow, so when you sharpen them, you sharpen them from the inside. This can be done a couple of ways. One of them is with the MS-1. 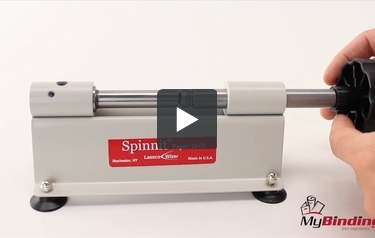 The MS-1 is an all in one unit that sits right in your workspace and helps you sharpen fast. Simply slide the bit into one end and the sharpener is on the other, both precisionally aligned so you get the best possible sharpening. All four feet are rubber suction cups so they rest gently yet hold their place as you work on your work table. And because of its size, this can often be done right there on the work table of the drill itself. There it is, it’s that simple with the MS-1 manual drill sharpener. Happy drilling. For more demos, reviews and how-to’s, check out MyBinding.com. Thank you for your question, It will not work with the Nygen Dahly Bits, only with the style A and style L drill bits.